Hubby loves to eat watermelon. In fact, he’s already addicted to it. 😀 He started the healthy habit after he discovered the health benefits of watermelon. The potassium content of melons helps control blood pressure and probably prevents strokes. 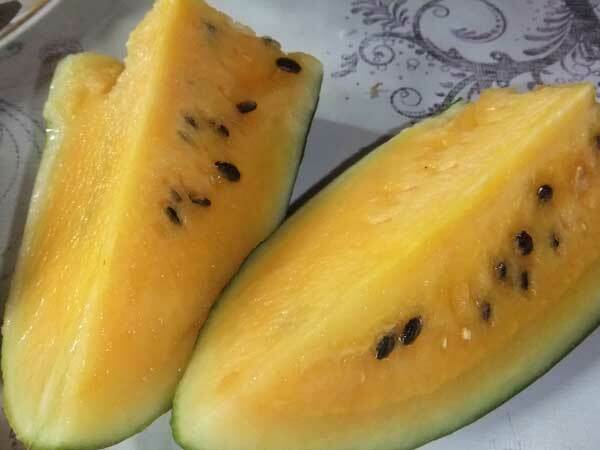 Watermelon is also rich in vitamin C, beta-carotene, and lycopene which are known to prevent heart disease, prostate, breast and endometrial cancers, lung and colon cancer. This entry was posted in Fruits and tagged benefits of watermelon, health benefits of watermelon, watermelon benefits on August 15, 2011 by Yami. I didn’t know that watermelon has lots of vitamins and healthful benefits. I know for a fact that it’s a fruit that has vitamin C and fiber. And that it is a refreshing fruit. And I haven’t seen a yellow watermelon. But I love the red one. I often make watermelon lemonade… I put chunks of seedless watermelon in the blender with lemon, lime and oranges (to increase sweetness since we don’t use any sugar or simple syrup). A great drink with lots of fiber and great health benefits.